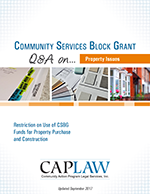 If your CAA has questions or concerns about the Community Service Block Grant Act (CSBG) prohibition against using CSBG funds to acquire, construct or permanently improve facilities, check out CAPLAW’s recent analysis of these complex CSBG Act provisions. With this analysis, CAPLAW proposes practical ways to approach and think about this often scrutinized section of the Act. It is important to note that the analysis does not represent the opinions of the federal Office of Community Services (OCS). To download the publication, please tell us a little bit about yourself. Don't worry, We do not sell or exchange names. Learn more about our site policy. © 2018 Community Action Program Legal Services, Inc.